Sharon Music Academy offers variuos music programs for preschoolers to prepare them for future music education. We maintain a small group size ( no more than 6-8 students ) to provide maximum attention to all students. Created by Zumba and BabyFirst, Zumbini is an early childhood education program that uses original music and movement to promote cognitive, social, fine/gross motor skill, and emotional development for a mixed-age group of children ages 0-4 ( toddlers and preschoolers ), all while creating the ultimate bonding experience for families. Zumbini is a fresh and exciting take on early childhood music and movement. Zumbini classes are enjoyable for both the child and the caregiver. The music is fun, original, and written specifically for the Zumbini program. Zumbini is the only early childhood music program to combine a live class with take home music and books to continue the fun at home, as well as our very own Zumbini Time TV show, which can be found on BabyFirst TV and YouTube. Classes are 45 minutes long and are held once a week by Zumbini Certified instructor. For more information about this program please read Zumbini Brochure. This preschool music program is a fun, group class for children between ages 3 and 4 designed to introduce children to music. Through musical games and active interaction with a teacher and each other, kids learn basic musical concepts such as: rhythm, melody, percussion instruments, and singing. “Jolly Notes” helps children develop general learning skills that they can use beyond musical studies: focus and concentration, cognitive abilities, motor skills, social skills and hand-eye coordination. The children are asked to bring their favorite short story books that can be set to music. At the end of the session the students will have a short musical presentation to perform informally for their parents. The gaol of the class is to instill a love of music so that the children could start music lessons next year. This course consists of 12 45 minutes weekly classes and is conducted by the Orff certified instructor. For more information about this program please read Jolly Notes Brochure. Register for Jolly Notes Program. "Jolly Keys" program is created as a comprehensive introduction to piano and gives children between ages 4 and 5 and their parents a taste what music can bring into their lives and prepares children for private music lessons. Children learn to understand musical "vocabulary", develop imagination as well as their own relationship with the music. The classes involve: singing, elementary note reading, introduction to the basics of the keyboard, music history and rhythm development. The course also focuses on general coordination and refining motor skills necessary for playing any instrument. The classes are 45 minutes long and are held once a week. For more information about this program please read Jolly Keys Brochure. Register for Jolly Keys Program. This is a group lesson course for children between ages 4 and 5 , who are not ready for private lessons. Students of this age, parents with a violin teacher known as the "Suzuki Triangle," learn to play the violin through the use of games, listening to music and visuals. At the end of the session, the students will have an informal recital. The students are known as "Pre-Twinklers", because they are learning musical concepts to be able to play "Twinkle Twinkle Little Star." It is the hope that this introduction to violin playing will become a life-long adventure to the study of the violin. Parents are encouraged to read "Nurtured By Love" by Suzuki to find out more about the violin method. Register for Preschool Music Programs online or contact us if you have any questions. Our experience supports these findings published in Forbes Magazine. Additionally, we strongly believe and emphasize that how you teach music is even more important for students’ brain development. 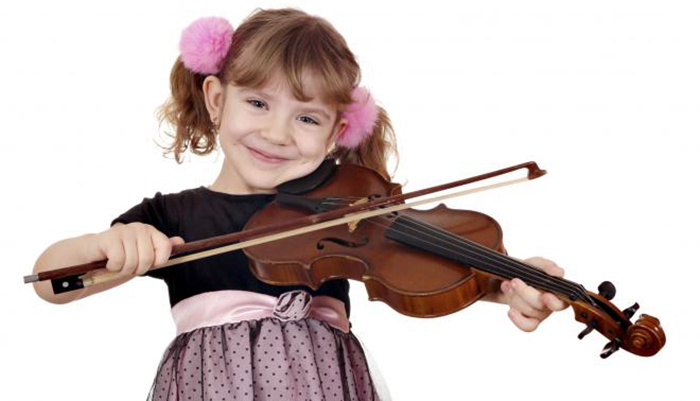 Scientific research encourages starting the study of music from a young age. Young children benefit the most from music lessons as they are the most receptive and impressionable. If a child is not ready yet for private lessons he/she can still greatly benefit from group music programs.